I've got inspired by a TV show about animal that was showing a giant fish that lives in Brazil. I don't remember the name of the species or where it lives, but the only thing I can remember is the expressions of the host (a Brazilian version of that Australian guy). He was so excited for finding that giant fish, he started to hug and kiss it... very embarrassing. 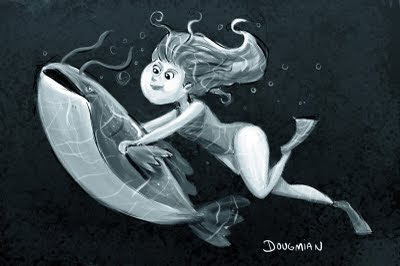 So, I decided to draw a girl swimming with the giant fish.